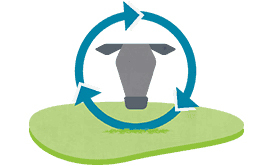 The Global Roundtable for Sustainable Beef (GRSB) was born from the need to promote continuous improvement in sustainable beef production. This member organization envisions a world in which all aspects of beef production are environmentally sound, socially responsible and economically viable. To help them tell their story, we developed a new brand identity and a series of communications positioning the organization and its mission.